A Memorandum of Understanding (MOU) to establish and protect Belize’s biological corridors and core areas that function as habitat for jaguars and their prey will be signed at 10 a.m. on Friday February 21, at the Black Orchid Resort, Burrell Boom Village, Belize District. Signatories to the MOU will include the Government of Belize, through the Ministry of Forestry, Fisheries, and Sustainable Development, the University of Belize through its Environmental Research Institute (ERI), and Panthera. The ERI, is dedicated to the science and conservation of natural resources and the development of Belizean human capacity. Panthera is a global non-profit organization dedicated to the conservation of wild cat species and their habitats, with a long history of jaguar conservation efforts in Belize and the Mesoamerican region. The jaguar, because of its mobility and sensitivity to human presence, along with its ecological function and its role in human culture, can provide an effective focus for monitoring the integrity of core areas and for corridor identification and conservation. Belize protects two large forest blocks (i.e., the Maya Mountain Massif in the south and the Rio Bravo Conservation and Management Area in the north) that function as core areas for the long-term conservation of Belize’s forest resources, wildlife, and ecological services. Parties to the MOU have agreed to establish and develop programs of cooperation in consultation with stakeholders, develop strategies for biological corridors in Belize that would serve to connect the core natural areas; promote the conservation of the corridors’ biological diversity, the maintenance of the vital functions of the corridor-and-core ecosystem and their integrated management. Another notable feature of the MOU is to ensure that proposed corridors remain ecologically functional as well as supportive of the people, communities, and livelihoods of the residents of these areas. Panthera’s Jaguar Corridor Initiative is doing just that by connecting and protecting core jaguar populations from Mexico to Argentina within human landscapes, while strategically balancing and supporting sustainable and economic human developments and mitigating human-jaguar conflict in these regions. Panthera has partnered with ERI to assure capacity building of Belizeans in the field of wildlife research, in particular jaguar research and conservation, and develop new collaborations with NGOs to assess the abundance and distribution of jaguars throughout Belize. The ERI, the Ministry and Panthera have also worked together towards corridor conservation in Belize, with Panthera supporting wildlife biologists at the ERI and a Jaguar Officer at the Ministry’s Forest Department. Through this partnership, Panthera has agreed to support the Ministry and ERI in securing funds for the management, monitoring and research within the area of common interest; whenever possible, the parties will seek external funding through cooperative proposals. Signing on behalf of the Ministry of Forestry, Fisheries, and Sustainable Development, will be the Minister, the Hon. Senator Lisel Alamilla, Dr. Alan Rabinowitz, Panthera’s Chief Executive Officer, and Acting President, the University of Belize, Dr Wilma Wright. Today, Belize signed on with 18 other countries to a memorandum of understanding which an official commitment from Government and its environmental partners to collaboratively implement science-based conservation initiatives that secure and connect jaguars and their habitats in Belize and beyond its borders, facilitate land development that is both ecologically sustainable and economically profitable, and mitigate human-jaguar conflict throughout the country. Now, it's an initiative which the experts say started in Belize, and it has finally come full circle with this MOU. "Now there are 18 countries signing these MOUs to maintaining the jaguar corridor. It doesn't mean necessarily a bunch of new protected areas, it means land use zoning; thinking of land where wildlife now becomes a part of the thinking of agricultural development; new road building and all those kinds of things. It just means a better way of thinking and where all the local communities and local people are involve in that way of thinking because it's their land, its where they live, it's their resources. Everything got started here 30 years ago and not only am I thrill to see it have come full circle now to where Belize is now signing this MOU for the jaguar corridor, but I want you to realize that you are a piece of the jaguar corridor as small as it might seem. When you look at a map from Mexico through Argentina, it's actually a very special piece of the jaguar corridor." "You have some of the wildest jungle I have seen remaining throughout jaguar range. You have some of the best jaguar populations throughout jaguar range. The only densities we have found equal to Belize have been a couple places in Brazil, a place in Bolivia, otherwise Belize have some of the densest jaguar populations in the world living with people, helping create a ecotourism industry and showing how jaguars and local communities can live together." The University of Belize hosted the event. Another initiative by Belize to contribute to a sane and sustainable world is picking up speed. We’re referring to the recent signing of a memorandum of understanding with 18 nations to create and safeguard a wildlife corridor aimed at preserving one of the world’s most magnificent creatures and a Belizean icon – the jaguar. 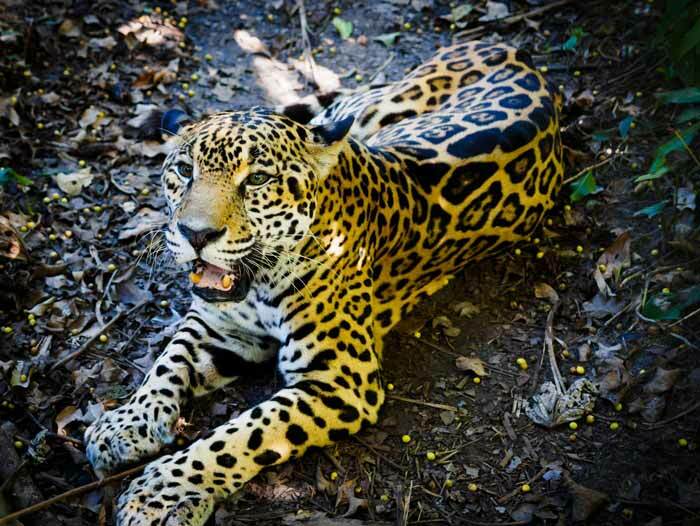 Thanks to an official commitment from the Government of Belize and its environmental partners, there is now formal agreement to maintain the corridor through the jaguar’s natural habitat from Mexico through Central America and down to Argentina. And according to a keynote speaker at the event commemorating the signing, Belize stands out for preserving a robust habitat for the big cats. Dr. Alan Rabinowitz, who is the CEO of the international non-profit organisation, Panthera was lavish in his praise for Belize’s efforts. “Everything got started here 30 years ago and…. Now there are 18 countries signing these MOUs to maintaining the jaguar corridor,” Dr Rabinowitz said. Here at Chaa Creek, and especially at our Belize Natural History Centre, we’re of course proud to see Belize lead the way and keep our big feline friends healthy, but we also realise the importance of keeping the pressure on and educating people about not only the beauty, but the importance of big cats such as jaguars, jaguarondis, mountain lions (the largest cats in Central America) ocelots, and margays to the environment. They act as nature’s gamekeepers; ensuring that the strong survive and the stocks of those animals that are part of their diet remain strong. In short, the cats are essential to the delicate balance of the stunningly beautiful forest we’re so fortunate to be surrounded by. Some of us of, um, a certain age, remember when there was a lively trade in big cat hunting and the sales of their gorgeous pelts. Those days are well and truly gone, and this is proof positive that (as with the trade in ancient Maya artefacts) the two E’s – Education and Enforcement work. And now with 18 countries on board in maintaining the wildlife corridor, our beautiful big cats stand a decent chance of continuing their important role in this amazing circle of life we’re surrounded by. Chaa Creek would also like to thank the University of Belize for hosting the event, and let’s all keep up the good work.